The following is a public service announcement from Culinary Types: Check the time. Did you set your clocks ahead one hour last night? Here in the United States, we just marked the return of Daylight Savings Time. The “Spring Forward” event, which used to happen in … the Spring … has now been moved forward by an act of Congress so that we can lose an extra hour of sleep and enjoy an extra hour of daylight in the dead of Winter. Very useful. About the only benefit I can see here, is that I can now place the blame for all my chronic time management and sleep deprivation issues squarely with the U.S. government. 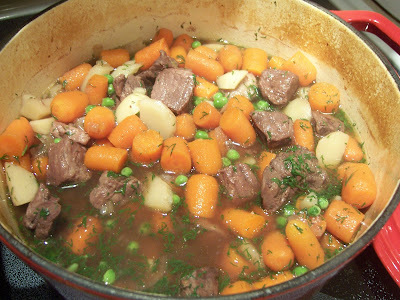 Fortunately, for those of us pressed for time, struggling to adjust all of the digital clocks in our homes and still needing to get a meal on the table, there’s Lamb Stew with Dill, Sweet Peas and Root Vegetables. Lamb was not a common dish growing up in “The Casserole Corridor” on suburban Long Island. It was costly and considered exotic. The only time we ever had it was during an occasional Sunday Dinner at Nana’s house in Laurelton. As multiple generations of brothers, sisters, spouses and cousins sat down at the table, Nana would announce, “I made lamb, because I know you never get it at home.” The traditional preparation was a roasted Leg of Lamb, served with iridescent green Mint Jelly that looked like it came straight from the dinner table of the Wizard of Oz. We knew that Nana spent hours preparing those Sunday Dinners, something most of us rarely have the time to do these days. But, lately I’ve been dreaming of lamb, perhaps as a more delicious way to accelerate the arrival of Spring, beyond simply pushing the clocks forward on some arbitrary date. Mark Bittman’s “How to Cook Everything” offers many variations on Lamb Stew that require about as much effort as tossing several ingredients into a Dutch oven. Frankly, turning all the household clocks forward is taking more time than was needed to prepare this stew. Served with fresh pasta, the lamb is rich, succulent and earthy, the sauce is light – more like a broth – and the addition of sweet peas and fresh dill makes this one-pot dish a welcomed harbinger of Spring. Preheat the oven to 350 degrees Fahrenheit. Place the lamb cubes and onions in a Dutch oven, add one cup of red wine, one cup of beef stock and season with salt and pepper. Cover, bring to a boil and place in the pre-heated oven for 45 minutes. Remove the leaves from the bunch of dill and tie the stems together with cotton cord. Add the carrots, potatoes and dill stems to the pot along with the remaining one cup of beef stock. Cover and return to the oven for about one hour. When the lamb is tender, remove the dill stems from the stew. Chop the dill leaves fine and add to the stew, reserving about one tablespoon for garnish. Stir in the frozen peas. The hot stew will warm the peas. Add some freshly squeezed lemon juice and season with salt and pepper. Garnish with chopped dill and serve. This recipe makes 4 to 6 servings and will put a spring in your step if Daylight Savings time has left you sleep deprived. I'm one of those people who wish for year-round Daylight Savings Time, so today I am celebrating! This dish sounds delicious, and I think will adapt quite well to the slow cooker I'm still trying to learn how to use. Yes, we did remember to set our time. 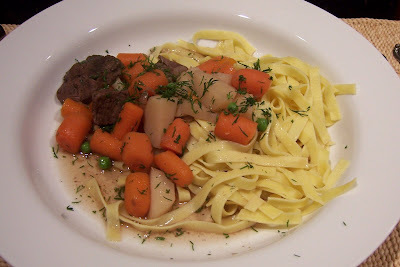 Lamb stew was one of my favortie dish as a child. This looks delish, T.W. That's interesting. I always thought lamb was a northeastern U.S. thing--a standard item found on every table. I don't recall ever eating lamb until I married someone from up there. I like it, but don't cook it myself--it's a favorite choice in a restaurant though. I'm still have trouble adjusting the the change. I'm a morning person, so getting up for the gym has been a challenge. That is one comforting pot of stew, T.W. Jeff would simply adore it. Susan - comforting indeed, and nice with a hearty glass of red!